Cramming 500GB of storage into that molten silver casing, LaCie's design partnership with Philippe Starck has gone USB 3.0 for faster data transfers—though of course it also works with USB 2.0 ports, too. While the internal hard drive looks ever so fragile, it's actually encased in a 2mm aluminum outer shell, so with any luck users shouldn't have any horrible mishaps. LaCie is also giving purchases of the external hard drive a 10GB one-year allowance for their Wuala online back-up service. LONDON, UK (9TH November, 2010) – LaCie announced today the latest addition to its USB 3.0 portfolio, bringing the fastest interface on the market to the award-winning design of Philippe Starck – LaCie Starck Mobile USB 3.0. Reaching speeds up to 10 times faster than USB 2.0*, the Starck Mobile USB 3.0 is an ideal gift for technology enthusiasts who demand stylish aesthetics with leading technology. Ensuring connectivity is never an issue, the LaCie Starck Mobile USB 3.0 is backward compatible with USB 2.0 – simply connect it into any PC or Mac for a seamless plug-and-play experience. 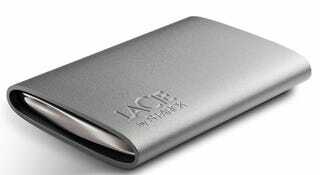 Encased in 2mm of sturdy aluminium, the LaCie Starck Mobile USB 3.0 is one the most resistant choices for consumer hard drives on the market. The aluminium offers resilience from blunders, improved heat dissipation, and is fully recyclable. The LaCie Starck Mobile USB 3.0 comes with LaCie Setup Assistant software to easily install your drive on PC and Mac. It also includes LaCie Backup Assistant, which helps make automatic backup a snap. In addition, you get 10GB of Wuala Online Storage included for one year to securely store, share and sync your data online. The LaCie Starck Mobile USB 3.0 will be available in a 500GB capacity through LaCie Online Store, LaCie Corner, LaCie Reseller+ and LaCie Storage Partner starting at the suggested retail price of £89.90 (Incl.VAT). For more information, visit www.lacie.com/uk. *Based on theoretical rate given by USB-IF. More information visit www.usb.org. For more than 30 years, Philippe Starck has been creating objects that have had an impact on the world. Designs such as the revolutionary lemon juicer or the transparent Louis Ghost chair have become cult items. He is also credited with setting the standard for creating classic hotels all over the world. His recent projects have included the artistic direction of a spaceport in the USA, a 120-meter yacht, and a personal windmill. Philippe Starck is a tireless and rebellious citizen of the world, who considers it his duty to share his ethical and subversive vision of a fairer world. He stays tuned in to our dreams, desires and needs- sometimes before we get there ourselves-by making his work a political and civic act, which he accomplishes with love, poetry and humour. For more information visit www.starck.com. With operations in the Americas, Europe and Asia, LaCie is the leading manufacturer of storage devices for PC, Apple, and Linux. LaCie has differentiated itself through sleek design and remarkable technical performance. Find out more about our products at www.lacie.com/uk.